Chocolate Caramel Thumbprint Cookies: These addicting homemade chocolate thumbprint cookies blend chocolate and caramel together to make an amazing dessert/midnight snack. Tomato/Tomahto. Rich, sweet, and practically perfect in every way. Perfect Thanksgiving dessert or Christmas cookie recipe! Chocolate and caramel might just be the best thing ever. I mean, have you ever had Rolo Pretzel Bites? Because once you taste things, you may literally never eat another snack again. Bite sized pieces of salty and sweet glory? I die. I’m telling you, chocolate and caramel makes the world go round. I don’t think this is historically accurate or anything at all, but I’m thinking that all those explorers who thought the earth was flat had never tasted caramel before. It definitely makes things 3-dimensional. 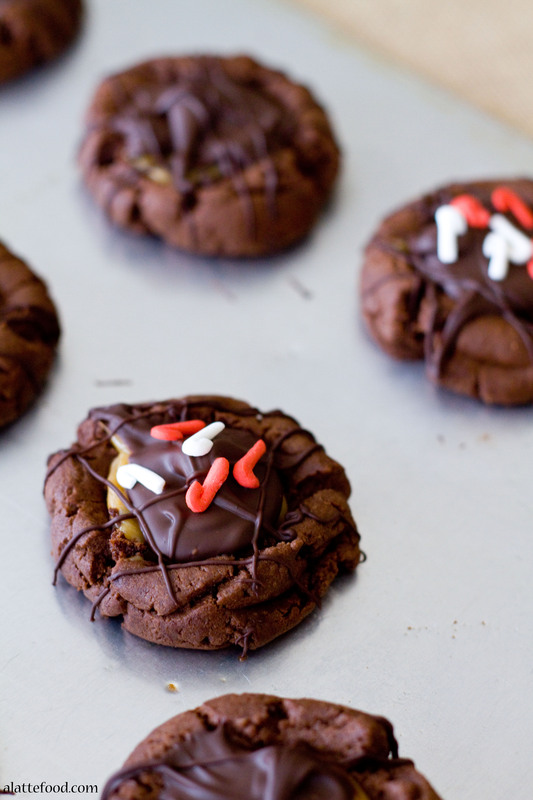 And these Chocolate Caramel Thumbprint Cookies? They’re as 3-dimensional and flavorful as it gets. These cookies are chocolate drops of greatness. They start off with the same batter as these Hot Chocolate Thumbprint Cookies, which are pretty insanely good too. I mean, s’mores meets hot chocolate in cookie form? Saaaay whaaat? I know. I’m dying again. Plus, adding caramel to the center is a great way to use any leftover caramel sauce you have, or caramels you were supposed to use to make caramel dipped apples, but instead made these (which were fabulously addicting but didn’t use up all the caramels). These cookies are incredibly customizeable, as you can decorate them with Christmas sprinkles–holla!–toffee bits, or just plain chocolate. …to eat. But the decorating part is great too, especially if you have kids who love to bake. I do not have children, but I’m not all that different from a child (no shame in admitting my child-like spirit 😉 ) so I assume they would love having a sprinkle party with these cookies. I would love to have a sprinkle party on everything. I’m going to suggest a glass of milk with your cookies. The plural was totally intentional. Cookies are the only way to go. I don’t think the singular exists. With a mixer, beat butter and sugar until light and fluffy. Add in the egg and vanilla. Beat. Once mixed, in a small bowl, sift cocoa powder, flour, espresso powder, baking soda, baking powder, and salt together. Slowly add dry ingredients into the wet. Mix until combined. Roll dough into 1-2 Tbsp sized balls (depending upon how big of cookies you want). Once on the cookie sheet, press your thumb into the center of the cookie (the edges will crack slightly). Place caramels and cream in a microwave safe bowl. Heat mixture in microwave on HIGH power in 30 second intervals, stirring after each interval until melted and smooth. Spoon caramel into indentation in cookies. Next, with a double broiler (or microwave), melt chocolate chips. Once melted, spoon a little bit of the melted chocolate onto each cookie. If you want to add any chocolate drizzles, put some chocolate in either a piping bag or a small sandwich bag with the tip cut off and drizzle over cookies. Add toppings to your liking. Allow chocolate to set, about 30-60 minutes at room temperature. Here are some other cookie recipes you might enjoy! OMG. These are perfection! Definitely making these with my kids this weekend! Chocolate and caramel is one of my favorite combinations! Love these cookies Michelle! These are FANTASTIC! Chocolate and caramel is the best. Pinned! where do I find espresso powder ….spice area or just use espresso coffee?